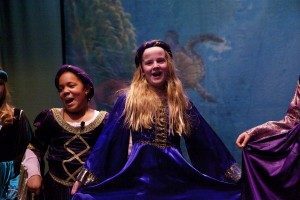 All students in grades 5 – 8 may participate in the drama program at St. John’s; however, those students having an increased interest in drama, or vocal and instrumental music may also audition for OASIS (Olney Arts School In a School). OASIS provides intensive, individualized training in drama, vocal and instrumental music that helps these middle school students prepare for application to signature high school arts programs. Arts School students develops confidence and poise for public speaking, as well as unique creative and artistic skills to be competitive members of the global community. Students complete a rigorous arts curriculum with an option to forgo the STJES foreign language requirement. The program includes master classes by professional artists and advanced performance opportunities. This class introduces students to the art of drama and improvisation. Students tell stories through dramatic improvisation and research an overview of world theatre. Video production class combines creative performance and presentation with technology education. Students organize and operate a newsroom to create a weekly 3-5 minute news program for the STJES community. They gain basic practical skill in digital video studio technology, editing and technical writing through hands-on exercises. Musical Theatre is a distinctly American originated art form, and a unique part of our cultural heritage blending the arts of drama, music and dance. In this trimester course, seventh grade students survey the history and scope of dramatic material, as well as gain an introduction to the musical production process (audition, rehearsal and performance) that will prepare them for the 8th Grade Play. The 8th Grade Play is a traditional St. John’s culminating performing arts and team-building project. Students select and produce a musical play that represents the character and legacy of each unique class. Immediately following the 8th Grade Play, students spend four weeks learning about professional opportunities in drama and the tools necessary for pursuing a career. A portion of class time is also devoted to selecting and practicing the class graduation song.